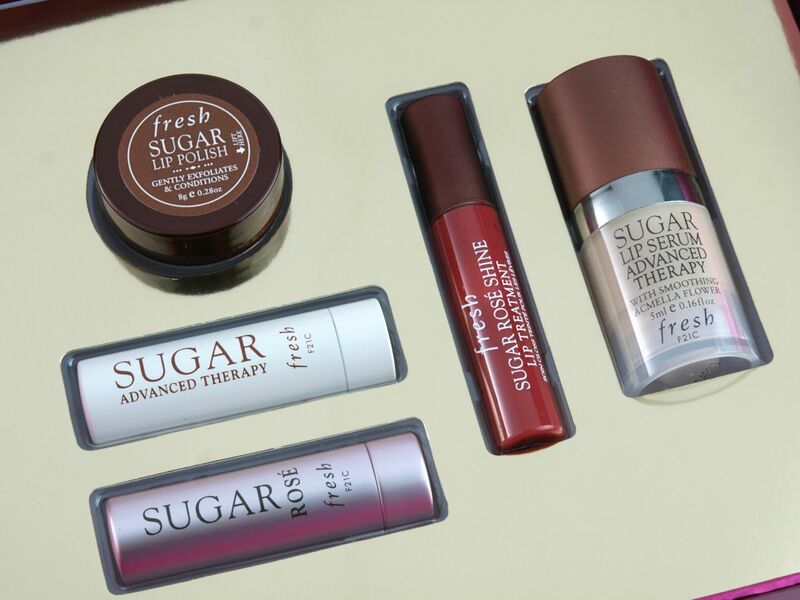 Fresh Holiday 2015 Gift Sets: "Sugar Lip Lovers" & "Skincare Affair"
This is a lips-only set with five deluxe-mini products. The Sugar Lip Polish is a brown sugar scrub that works very well at removing dry patches on the lips. It leaves behind a slightly oily residue which can be a bit much, but it definitely keeps the lips moisturized. The Lip Serum claims to decrease the appearance of fine lines on the lips, which sounds very promising but I'll have to try it to see how it differs from a solid lip balm. This is a lovely skincare set with a bonus full-sized Sugar Advanced Therapy Lip Balm, which is hands down one of the most nourishing balms I've tried. The Black Tea Instant Perfecting Mask (full review here) is also another favorite of mine; it is the best out of all the Fresh Masks I've tried. In terms of value, this is a great set and I love how there is pretty much a product from every skin care category so you can get the full Fresh experience.